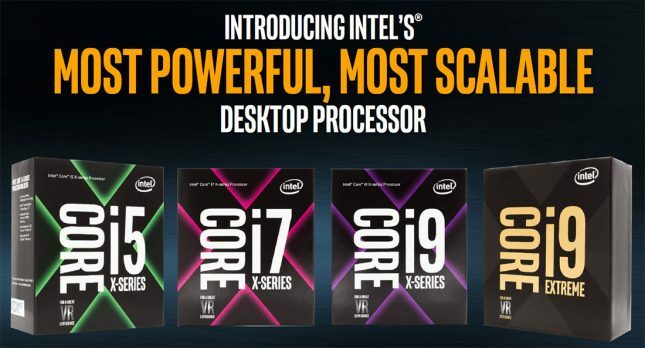 Intel has finally taken wraps off its long-awaited Core X-Series processors and accompanying X299 chipset, which means high-end desktop computing is going to be getting a big horsepower injection! 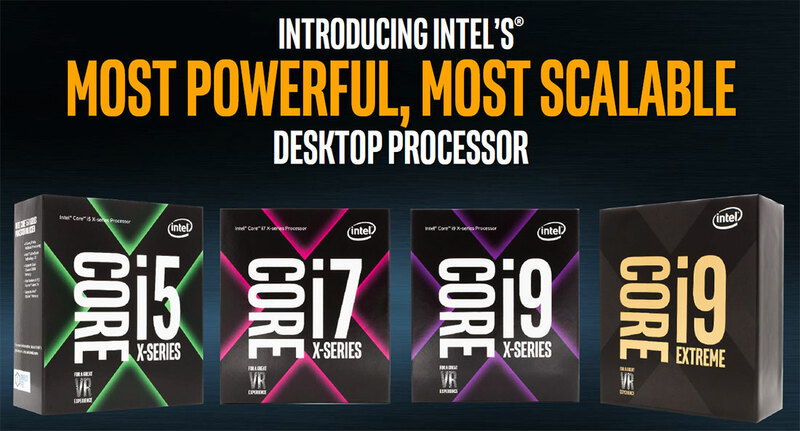 The Intel Core X-series processor family introduces Intel’s first teraflop desktop CPUs, the entirely new Intel Core i9 processor, and the first consumer desktop CPU with 18 cores and 36 threads. 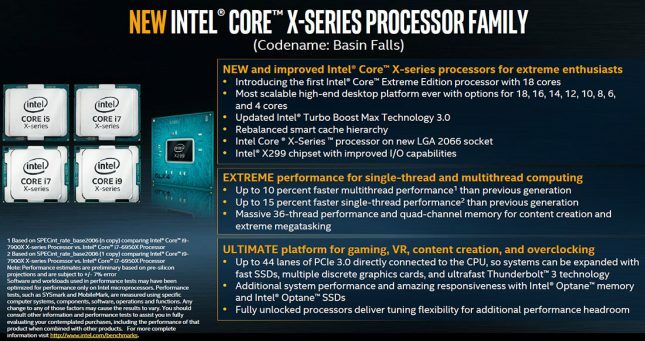 This is by far the fastest desktop processor every released, but Intel is actually introducing a total of 9 processors for the new ‘Basin Falls’ X299 platform ranging in price from $242 for a quad-core Intel Core i5-7640X all the way up to $1,999 for the Intel Core i9-7980XE 18-core monster. The new Intel Core X-Series used the brand new LGA2066 socket and consists of a mixture of ‘Skylake-X’ and ‘Kaby Lake-X’ CPUs. Since this is a new desktop CPU socket, it means that you’ll need an ‘Basin Falls’ X299 HEDT (High-End Desktop) platform to run any of these new processors. 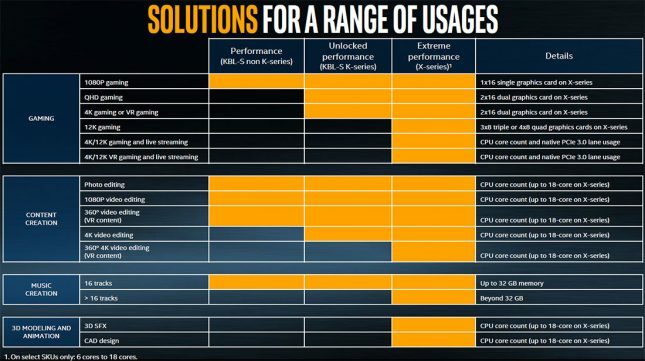 Intel’s new X299 platform and raises the bar for CPU performance with support of up to 18 cores, support for up to 44 lanes of PCIe 3.0 directly connected to the CPU, and Intel Turbo Boost Max Technology 3.0. When it comes to memory support, the X299 platform supports up to 128GB of quad-channel DDR4 memory for an incredibly potent and flexible platform. Who needs a $1,999 processor with 18-cores and 36-threads like the Intel Core i9-7980XE for 1080P gaming? No one on a budget, but that really isn’t the target audience for the Intel Core X series. Intel is suggesting the Core X-series for 12 gaming, 4K/12K VR gaming and live streaming, 360 degree 4K video editing, music creation with over 16 tracks and lastly those that do 3D modeling and animation. It also is coming to compete with AMD’s new brand of processors called ThreadRipper that have up to 32 cores and will be coming out this summer as well. AMD is entering the HEDT market for the first time in years and the Threadripper is going to bring a solution derived off AMD’s EPYC server processors just like Intel does with Xeon server processors. We all saw the AMD versus Intel battle in this segment coming, but it’s actually here now! Here is the table of Intel’s nine is processors that make up the Core X-Series processor family. The bottom two parts (Intel Core i5-7640X and Core i7-7740X) are based on Kaby Lake-X while all the rest are Skylake-X processors. The first thing you might notice is that Intel isn’t revealing everything today. Intel is only revealing clock speeds and details on the 4-core to 10-core parts and keeping the 12, 14,16, and 18-core parts a secret until mid June. As we already mentioned the Intel Core i9-7980XE is the flagship processor with 18c/36t for $1999, but don’t let that price freak you out. Take a look at the Intel Core i9-7900X processor real fast. The Intel Core i9-7900X has 10 cores, 20 threads with 44 PCIe 3.0 lanes and clock speeds of up to 4.5GHz for $999. Less than one year ago we saw Intel introduce the Intel Core i7-6950X with 10 cores, 20 threads, 40 PCIe 3.0 lanes and clock speeds of 3.5 GHz for $1,723. Intel has slashed the price of their 10-core processor by $724! So, you might get hung up on the fact that there is a $1,999 desktop processor now, but when you take a second look pricing has actually improved over last year thanks to pressure in this market space from AMD. All of the processors are interesting, but another standout would be the Intel Core i7-7800X at $389. This processor has 6 cores, 12 threads, a 3.5GHz base clock, 4.0GHz Turbo Boost 3.0 clock, 28 PCIe lanes and quad-channel DDR4 2666MHz support. That isn’t a bad price as it is around $50 more than the current Intel Core i7-7700K quad-core processor and $10 less than the MSRP of the AMD Ryzen 7 1700X processor. A good number of high-end gamers are willing to spend $400 on a processor, so we see this processor being the most popular as to go up to the Core i9-7820X 8-core/16-thread processor will cost you over $210 more. Let’s take a look at some of the new Intel technologies for the unlocked Intel Core X-Series Processor Family!